Kosuke (Yusuke Santamaria) returns home to Japan after an attempted stand-up comedy career in New York fails to eventuate. Home is Sanuki in Kagawa prefecture, where udon noodles are a local tradition and where Kosuke’s ill-tempered father (Katsumi Kiba) runs a popular udon takeaway restaurant. A chance encounter with a bear introduces Kosuke to aspiring writer Kyoko (Manami Konishi), and together their interest in udon leads them to launch a local magazine on the subject – a magazine that sparks off a nation-wide craze for them. Japan has always struck me as a country and culture with a fairly strong obsession for food. It is very clear from Japan’s film industry, where numerous films embrace local cuisine and showcase it in all manner of enthused ways: Tampopo, Jiro Dreams of Sushi, The Flavour of Green Tea Over Rice, Sweet Bean, and Kamome Diner all immediately spring to mind. Watch any given animated film from Hayao Miyazaki and it won’t take long to reach scenes of family meals and beautifully illustrated food. 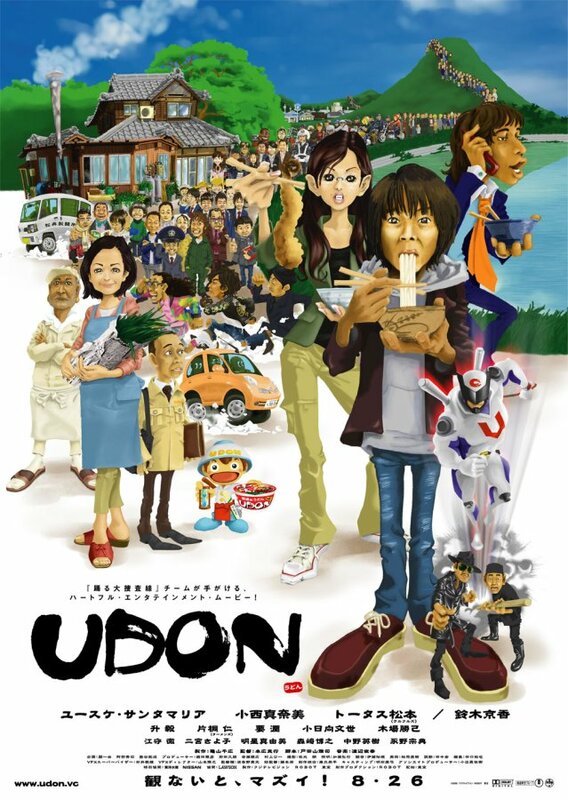 One can easily add to this list Katsuyuki Motohiro’s 2006 comedy-drama Udon, which focuses as much on the titular Japanese style of noodle as it does Kosuke’s return home and his interactions with his friends and family. This is a movie that will make most viewers of it crave a bowl of noodles. That is not to say the film is flawless. At 135 minutes, it is particularly over-long and has a tendency to drag in its more fallow moments. Writer/director Motohiro was born in Japan’s Kagawa prefecture and visited 200 separate udon restaurants in his preparations for the film, which leads me to wonder if he simply found too much small detail and wanted to include as much of the local flavour as he could manage. Whatever the motivation it does make Udon something of a slog; particularly at the 70-minute mark or so, when it feels as if the film has dropped one narrative for another and everything starts up all over again. The film seems stronger during its first half, which details the establishment of the udon magazine and the formation of its editorial team. It is also this section that seems to present and describe the various udon varieties with the most enthusiasm. The second half is much less comedic and more concerned with Kosuke’s difficult relationship with his father. It is reasonably well presented drama, but lacks the entertainment value of the earlier scenes. Yusuke Santamaria performs his lead role fairly casually, although there ultimately is not too much depth to his character. As Kyoko, Manami Konishi delivers something a bit more energetic and funny. She gains many of the screenplay’s best gags, and plays them out well. A wide variety of supporting players add a lot of action to the film, but not a great amount of depth. At times it also becomes too crowded and busy to properly follow, but to Motohiro’s credit on an individual scene-by-scene level there is a lot to recommend. A little too long, then, and a little too busy and haphazard, but when the noodles are poured out it’s hard not to be enticed. Udon is a Japanese food fan’s delight.